On 30 June, 1960 Congo achieved independence from Belgian rule. It was an exceptionally harsh 80 years of colonialism which saw tens of millions of its people killed in the pursuit of European wealth and civilisation. But, today, we live in a different era; a new millennium. Who remembers the Congo of its valiant freedom struggle; the Congo of Patrice Lumumba? Fifty years is a long time in human terms; but perhaps a mere speck in historical time. Fifty years of lost possibilities and deliberate destruction of the Congo. 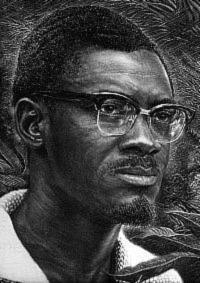 It may not be remembered today but Patrice Lumumba was murdered, within months of the country gaining independence, by a firing squad led by a Belgian army officer. It is now well documented that the United States’ CIA played a crucial role in his murder. Here is another account of his killing. All because he was unwilling to allow European and US corporations a free run of Congo’s natural resources. Read this blogpost for a wonderful expose of how the “free” media of the West deliberately colludes with those strip-mining Congo of its wealth and honour. Watch this informative video on Lumumba and how the Congolese won and lost their independence from imperialism. The Congo remains enmeshed in civil war and killings, much of which now seem to be fuelled by Coltan, a mineral essential to meet our ever growing desire for electronic goods like mobile phones, laptops and cameras. I had helped draft an editorial for the Economic and Political Weekly in February 2009 on this same issue. Congolese people, be vigilant. The enemies of our country and the accomplices of the Belgian imperialists are unmasking themselves. seems still relevant. Since Lumumba’s killing, Congo has been a merry hunting ground for some of the world’s largest, and most “respectable”, multi-national corporations. Just in the past 15 years, as many as six million people have been killed in the Congo as MNCs have funded wars to control its natural resources. I wanted to end this post with some hope. Unfortunately, I don’t see any, at least with what is happening to/in the Congo, where now the new colonialists come holding the red flag! Post script: For those interested in reading more, Joseph Conrad’s Heart of Darkness (or if you prefer a printed version) and Adam Hochschild’s King Leopold’s Ghost are good places to start. Your articles on Haiti and Congo are very informative. I never studied colonialism outside the Indian sub-continent. Once thanks for the informative piece of history awareness.